Alfalfa and beans are leguminous plants that can be eaten by humans. Both are commonly eaten in the form of sprouts, which are the young growth of the plant that appear in the earliest stages of growth. They are the first sprouts that emerge as the plant begins to grow following germination of the pea or bean. Beans are often also eaten before they have sprouted, but alfalfa is most often eaten by humans in the form of sprouts. Other types of sprouts from other plants such as onions and snow peas can also be eaten. Both Alfalfa and bean plants are types of legumes, which are a group of plants that share certain characteristics, notably the ability to fix nitrogen in the soil. This means that they can actually improve soil quality when they are grown. Bean sprouts are young bean plants that are still in the earliest stages of growth. There are many different species of bean and bean sprouts may come from different types of beans. Mung beans are among the most common sources of bean sprouts, but other types of beans can also produce edible sprouts and soybean sprouts can be more common in parts of Asia. The sprouts of mung beans are typically referred to simply as bean sprouts, with the sprouts of other types of bean often being named more specifically. Alfalfa sprouts are essentially a type of bean sprout. 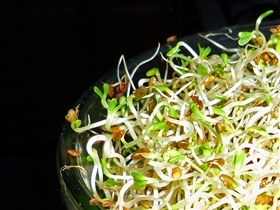 If left to grow, both alfalfa sprouts and bean sprouts could develop into adult plants. If the alfalfa or beans are to be used as sprouts, they will need to be exposed to water in order to encourage growth. Alfalfa sprouts are long, very thin and wispy white sprouts at the end of which there are usually two tiny green leaves. The appearance of bean sprouts varies depending on the type of bean. Some beans, such as soybeans, produce shorter, sturdier sprouts, while others, such as mung beans, produce longer, thinner sprouts. Bean sprouts are typically thin sprouts that extend out of and remain attached to the bean. There may be signs of the earliest leaves beginning to develop at the end of the sprout, and there may even be a hint of green color in the sprout rather than the usual creamy white color. Mung bean sprouts are the most common and familiar bean sprouts. They are long and thin, and they often have tiny, yellowish-green leaves at one end of a long white root. Alfalfa sprouts are very delicate, so they are not usually cooked. Instead, they are eaten raw, usually in a salad or as part of a sandwich. 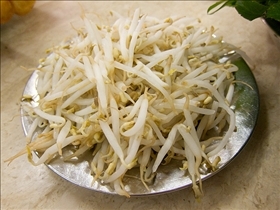 Bean sprouts can also be eaten raw, but they may also be cooked before they are eaten. Typically, they will be added to a lightly cooked dish, such as a stir fry in order to preserve their crunchy texture. Mung bean sprouts are crisp, with a nutty flavor. They can be eaten raw, but they have a particularly good flavor for stir fry, in which form they are very popular. They may also be used in other dishes such as spring rolls, or served as a side dish after being gently cooked in water. Soybean sprouts are particularly crunchy. They are eaten while the bean sprout is still short because otherwise they begin to taste too buttery. Soybean sprouts produce a very bean-like flavor. They may be used in stir fries or in salads. Alfalfa and bean plants also have other uses. Alfalfa is commonly used as a source of fodder for livestock, in which case it is grown to adulthood and harvested in a similar way to hay or grass. Alfalfa in its adult form can be an excellent source of protein, which makes it a good choice for livestock. Adult alfalfa plants can also be eaten by humans, often in the form of dried teas or herbal remedies. Alfalfa sprouts and bean sprouts are both young forms of leguminous plants that can be eaten by humans. They are similar in appearance, being the youngest sprouts to emerge and therefore long, thin and pale. However, alfalfa sprouts tend to be much thinner and more delicate than bean sprouts. Beans are eaten by humans both as un-sprouted beans and as bean sprouts. Bean sprouts are usually sprouted mung beans or soybeans. Bean sprouts are often used raw in salads, or cooked in stir fries or other dishes. Alfalfa sprouts are not usually cooked, but are eaten in salads or sandwiches. Adult alfalfa plants are also used to produce teas, herbal remedies and animal fodder. Which sprout taste better on a sandwich?